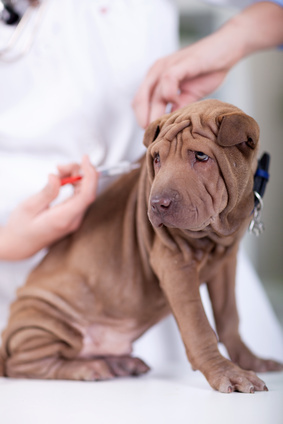 Many serious infectious diseases of cats and dogs can be controlled by vaccination. With over 20 million pet cats and 50 million dogs in the U.S., your pet is quite likely to come in contact with an infectious disease at one time or another. Even indoor pets can be exposed to viral diseases carried in the air, in dust, or on clothing. Vaccination is inexpensive protection against costly treatment, or even the premature death of your dog or cat! Rabies is a FATAL INFECTION of the nervous system that attacks ALL WARM-BLOODED ANIMALS, INCLUDING HUMANS. Rabies has become synonymous with the image of a vicious dog or wild animal, but cats have outnumbered dogs in reported cases since 1981. Rabies is a public health hazard and a personal risk to all pet owners. Many states require vaccination against rabies, and most veterinarians recommend vaccination for all dogs and cats, regardless of state law. Rabies can be transmitted through the bite of an infected animal. Even dogs kept indoors can come in contact with a rabies carrier in a basement, garage, or attic. Because there is no cure for rabies, vaccination is your pet's only protection. Canine Distemper (D in DHPP)is very widespread, and nearly every dog will be exposed to distemper within the first year of life. Once the virus enters the nervous system, convulsions, twitches, or partial paralysis become evident. It is spread through all body secretions and is HIGHLY contagious. Infectious Canine Hepatitis (H in DHPP) affects the dog's liver. Spread through an infected dog's urine, exposure can mean anything from a mild infection to death. Puppies are at the most risk with this disease. Vaccination has controlled this disease for several years, making it rarely seen by the veterinarian today. Canine Parainfluenza (P in DHPP) is a highly contagious upper respiratory infection which can progress to pneumonia in puppies and chronic bronchitis in older dogs. Thanks to responsible vaccination practices this illness is well controlled. Canine Parvovirus (P in DHPP), since it's devastating worldwide appearance in 1978, most dog owners have heard of parvo. It is transmitted through direct contact with an infected dog's feces. A dog that recovers from the disease remains a "carrier", spreading the virus in its bowel movements for 1-3 months. Signs include vomiting, fever, depression, and diarrhea (which often will contain large amounts of blood.) The younger the pet, the GREATER the chance of death. Dogs remain susceptible to Parvovirus infection until TWO WEEKS AFTER THE LAST INJECTION in the vaccination series. This is the MOST SERIOUS and FATAL disease we see today. Canine Cough Complex (Bordetella or "kennel cough") technically known as "tracheobronchitis," it is an upper respiratory infection with the major sign being a persistent, dry, hacking cough. It often lasts several weeks and is HIGHLY CONTAGIOUS. Feline Viral Rhinotracheitis and Calicivirus (FVR and C in FVRCP) are both highly contagious and widespread. Feline Viral Rhinotracheitis and Calicivirus can cause severe upper respiratory infection, which can lead to pneumonia and even death. Upper respiratory infections are easily spread from cat to cat by sneezing and direct contact as well as shared bowls, beds, and toys. A stray cat that seems outwardly to be healthy can be a carrier infecting your pet, even through a screen window. Feline Panleukopenia (P in FVRCP), also known as "cat distemper" is a highly contagious and often fatal disease in young cats. It is easily transmitted from cat to cat. Feline Leukemia (FeLV) was unknown 20 years ago, but is now considered to be the leading cause of death in cats. It is a cancer-causing virus that often suppresses the ability to fight other infections. Kittens can be born with the virus. Cats can have the leukemia virus for years before showing signs of the disease. Feline Leukemia is not transmissible to humans or dogs. There is no successful treatment once signs develop! Young animals need to follow a specific schedule of vaccine boosters to fully protect their immature immune systems. If the 3 to 4 week vaccine schedule is not strictly adhered to, additional boosters may be necessary for complete disease protection. Vaccine recommendations for your individual pet may differ. If you have any questions, please call our office.